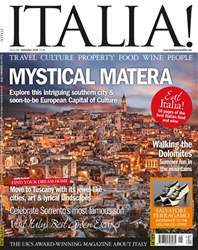 The subject of our cover feature this month (over the page) is Matera, one of the oldest continuously inhabited cities in the world. But there are other notable prehistoric dwellings in Italy, not least within Sicily’s Riserva naturale dello Zingaro. The park includes land, sea and beaches and is home to many varieties of endemic flora and fauna. Here also is the Grotto dell’Uzzo, one of the first prehistoric settlements on the island.